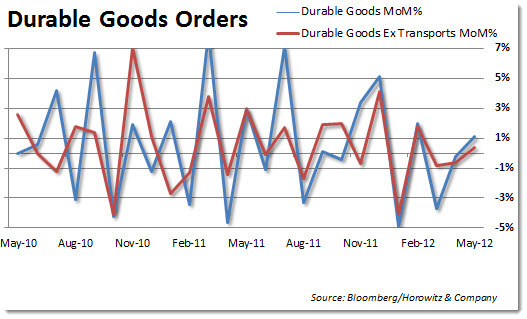 Durable goods rose more than expected. Analysts were looking for a 0.5% and the 1.1% was a decent surprise. Some of that was due to the noisy nature of month to month numbers and the fact that last month was revised down from +0.2% to -.2%. So, on the whole, it was not really a big differential as some of the increase comes from the benefit of the revision. Orders for durable goods and the number of Americans signing contracts to buy an existing home rebounded in May, easing concern the world‘s largest economy is faltering. Bookings for goods meant to last at least three years rose 1.1 percent, the first increase since February, a Commerce Department report showed today in Washington.